While summer weddings are popular with some brides and grooms, many couples seek that magical wedding during the cooler months between October and March. Cold weather weddings can make for a beautiful, cozy and romantic setting. With some careful considerations, you can plan an absolutely amazing experience for you, your beloved and your guests, no matter how cold the temperatures fall outside. Your wedding venue in Northwest Indiana offers this quick guide for your successful cold weather dream wedding. Something to consider for you and your guests is to select a single venue for both the wedding and the reception. Not only will this cut down on transportation time, but it will also keep you and your guests from having to go outside during the cold, unpredictable weather. Another consideration should be to keep both the ceremony and the reception indoors. This way, Mother Nature cannot wreak havoc on your wedding plans. A beautifully appointed banquet hall can serve as a perfect venue for both your wedding vows and the elegant reception to follow. When shopping for a cold weather wedding, there are some things to keep in mind. If you do plan to hold your ceremony outdoors or are traveling outdoors between the ceremony and reception, you will want you and your party to be comfortably warm and stylish. Consider long dresses for the bride and bridesmaids. Perhaps even long sleeves would be appropriate. These dresses can look exceptionally elegant and will keep everyone warm. A handy tip from wedding experts is to sneak a pair of warm leggings beneath a long dress. No one will notice! The gentlemen, meanwhile, can wear wool suits that will keep them warm while looking incredibly handsome. Perhaps formal coats can be purchased or rented for outdoor photos and to don when making the grand exit. Stylish scarves and wraps can be added to complete the ensemble. Your wedding party can look positively glamorous in cold weather. Keeping your guests warm should be a high priority. As your guests arrive inside from the cold, there are several simple things you can offer to make them smile. Have warm drinks available upon their arrival. Mugs of hot apple cider or hot chocolate will be very welcome after coming in from the cold. A coat check is a classy way to keep your tables and chairs looking gorgeous and uncluttered. Once your guests have shed their coats and have a warm beverage in hand, they will be delighted to be presented with warm snacks. Perhaps you could have a s’mores station. There could be tomato soup shooters or mini grilled cheese sandwiches. And as a table gift, each guest may find a small bottle of hand moisturizer to combat the dry skin that’s so common in winter. 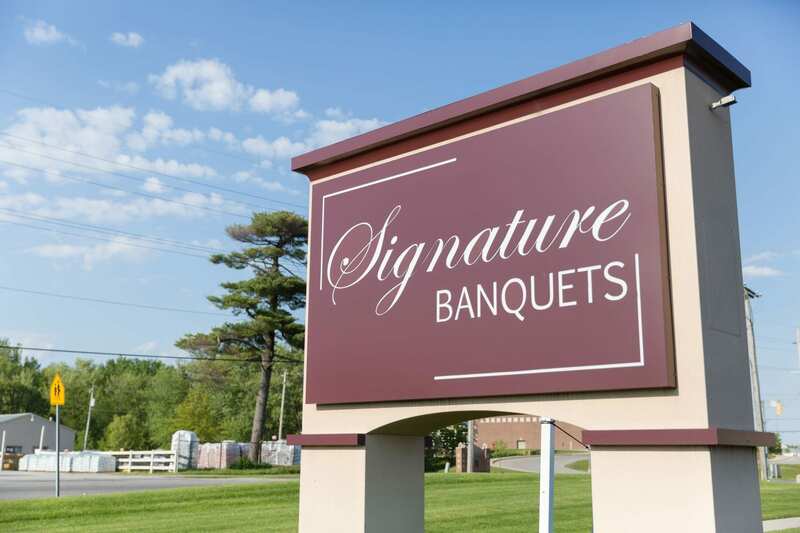 If you are considering a cold weather wedding, look no further than Signature Banquets. We are among the premier wedding venues in Northwest Indiana. With over 30 years of experience in the industry, we have the expertise to handle your big event. Give us a call today to see how we can make your cold weather wedding day truly memorable!